The press conference titled “Openness of institutions of executive power in the region and Montenegro” took place on April 24, at the CentreVille hotel in Podgorica. This event saw the presentation of the results from the research on openness of executive powers in the region, carried out within the project ACTION SEE – Accountability, Technology and Institutional Openness Network in SEE. The head of the delegation of the European Union in Montenegro, Mr. Aivo Orav, said good governance is impossible without open institutions, and without good governance there is no rule of law. “If institutions don’t share information, it usually means that they have something to conceal. Such secrets should not exist for countries that strive to become members of the EU.” – Orav said. “There isn’t a thing such as too much transparency and too much openness” – he concluded. The State Secretary of the Ministry of Public Administration of Montenegro, Mr. Goran Jovetic, said that the state institutions’ level of openness and transparency is a precondition for every democratic and economic progress. Mr. Dragan Koprivica, director of the Center for Democratic Transition – CDT, one of the partner organizations in the ACTION SEE project, said that openness of powers is one of the fundamental postulates of good governance and an important feature of every democratic society. “Openness is general i.e. public value of developed societies and an important instrument in the hands of institutions and citizens for control over powers’ work. Also, it represents an important instrument for prevention of corruption” Koprivica said. Unfortunately, he deems that this is a poorly covered topic throughout the region, and the concrete steps for meeting the openness standards are even poorer. “Therefore, the members of the ACTION SEE network, supported by the National Endowment for Democracy (NED) and the European Commission, have developed a scientific methodology for measuring the openness in the region. We have prepared indicators that give authentic image of the openness and we have gathered data on governments, ministries and other state bodies from 6 countries in the region” Koprivica added. Institutions’ work has been measured on the basis of more than 80 indicators and there have been more than 15.000 pieces of data about them. “The openness policy must be a policy of all governments in the region, it must find its place as the other important state policies”, Koprivica concluded. 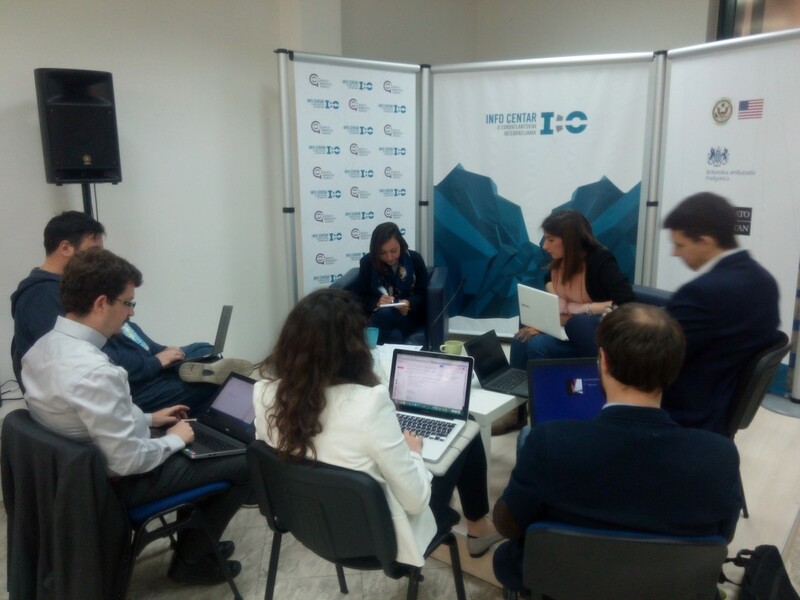 Representatives of Center for Democratic Transition – CDT from Montenegro, Why not? from Bosnia and Herzegovina, CRTA from Serbia, Metamorphosis from Macedonia, Mjaft! from Albania and Open Data Kosovo from Kosovo talked about executive powers in the region. The openness of executive powers hasn’t reached satisfactory level. On average, openness fulfils 47% of indicators. Openness of executive powers of Montenegro holds the first place in the region with 66% completion of indicators. It’s followed by Serbia with 56%, Bosnia and Herzegovina with 44%, Kosovo with 40%, Albania with 38% and Macedonia with 36%. Lack of openness of institutions has been noticed in several fields, from implementation of the Law on Free Access to Public Information, showing the way institutions spend citizens’ money to use of obsolete means of communication. The third meeting of the partners in the project ACTION SEE – Accountability, Technology and Institutional Openness Network in SEE took place on 24 April 2017 at the Info Centar in Podgorica. This meeting was attended by representatives of Metamorphosis Foundation, project coordinator, and the partner organizations Westminster Foundation for Democracy from Great Britaint, Citizens Association Why not? from Bosnia and Herzegovina, Center for Democratic Transition from Montenegro, Open Data Kosovo (ODK) from Kosovo, and Levizja Mjaft! from Albania. The regional results from the research on the Index of openness of institutions as well as the future steps and activities in the project were discussed during the meeting. The project aims to increase the inclusion of civic society and media organizations in decision making processes and the creation of public opinion and policies, as well as to raise the capacity of civil society to address sensitive issues. The project is implemented with the financial support of the European Union. The Openness of the Executive Index for Serbia of 56 percent points to the need for further efforts towards achieving the full openness of public administration in Serbia. The institutional openness of the executive (Government, ministries, Government of the Autonomous Province of Vojvodina and other government institutions) is marked by unequal practices and performance regarding the compliance with the legislature regulating issues of transparency, accessibility, integrity and effectiveness, as well as differences in the level of fulfillment of indicators among the institutions. These are the findings of the “Openness of the Executive” analysis, conducted by CRTA within the regional network “ActionSEE”. “Openness of the public administration, including its transparency and openness to citizens, as well as the opportunities for citizen participation in decision making, development of laws and policies, is one of the main principles of the public administration reform in Serbia. The progress in the level of the public administration openness is a result of the broader public administration reform, established as one of the main preconditions within the EU integration process. However, many deficiencies and problems persist, and they need to be addressed”, CRTA representative Pavle Dimitrijevic stated. This Index measures the level of institutional openness towards citizens and the public, based on four basic principles: transparency, accessibility, integrity and effectiveness. In line with the international standards and recommendations (EU, SIGMA/OECD, Open Government Partnership, World Bank), these principles were further defined through specific indicators, assessed on basis of access to information through the institutions’ official web pages, the quality of the legislative framework regulating specific issues, other public information sources and questionnaires distributed to relevant institutions. Executive institutions in Serbia fulfill majority of indicators in area of transparency, primarily regarding the access to information about their organizational structure. This is the consequence of the implementation of the Law on Access to Information of Public Importance that obliges the institutions to publish the Information Booklet with basic information about their work at least once a year. However, the problem of non-compliance of the Information Booklets with the Guidelines for Publishing Information Booklet continue to restrict the public access to information. In comparison to the access to organizational information, the access to information about public procurements and budgets is at the lower level, which shows the tendency of the executive to hide the information about economic affairs and management of public resources from the public. Regarding the integrity, the implementation of the anti-corruption legislature contributed to the higher access to information about public officials, such as the public officials’ property cards, income and sources of income, which can be found at the Anti-Corruption Agency’s website in organized and structured form. The gaps in communication and interaction with citizens were noticed in practice within some institutions. Civil society participation in creation of public policies is more the exception than the rule, which is partly the consequence of the lack of systemic approach to the civil society engagement in policy development. Although majority of executive institutions recognize the importance and benefits of social networks as tools and channels for communication with citizens, these channels are irregularly and insufficiently used by institutions. Executive institutions show very low level of effectiveness, reflecting in reporting, monitoring and strategic planning, due to unregulated system of public policy planning and implementation in Serbia, as well as the lack of efficient mechanisms for planning, coordination, implementation and monitoring of public policies. In cooperation with partners from a regional network “ActionSEE”, CRTA prepared a policy paper which analyzes the level of transparency, openness, and accountability of the executive in the Western Balkans region. The analysis of the executive openness is the first segment of the regional research on government openness. Detailed analysis is available at this link. According to the analysis of information on the quality of electoral processes received from the representative and random sample of 450 polling stations, and the review of polling board records compiled after closing of polling stations, the CRTA election observation mission „Citizens on Watch“ assessed that the Election Day went mainly in accordance with established procedures, and that the information about voters’ turnout and voting results for individual election candidates corresponded to the official results of the Republic Electoral Commission (on the basis of 99,9 percent of processed material). The CRTA election observation mission „Citizens on Watch“ stands behind its preliminary election monitoring findings regarding the quality of the elections conduct prior to and during the Election Day. To clear any doubts regarding the most recent allegations of the Election Day misconduct, referring to subsequent changes to polling board records, CRTA will file the request for access to polling board records submitted to the Republic Electoral Commission, in order to compare them with records photographed by CRTA’s observers at their polling stations on April 2. CRTA appeals to all authorized institutions to investigate allegations of potential malpractice in handling the election material and attempts to redraw citizens’ electoral will, and to inform the public of the findings. Preliminary findings of the Election Day observation showed that the election irregularities recorded at three percent of polling stations could not influence the election results. Recorded irregularities included individual cases of not checking voters’ identification prior to voting, not using the invisible spray, handling of parallel lists with voters’ names. Irregularities with voters list were recorded at 27 percent of polling stations, which points to the systemic problem regarding the voters list. It is important to underline that a small number of Serbia’s citizens is affected by this problem, namely 0,2 percent of voters. The CRTA election observation mission „Citizens on Watch“ filed 18 complaints regarding irregularities recorded during the Election Day to the Republic Electoral Commission, out of which three were adopted. CRTA appealed to the Administrative Courts regarding 11 complaints rejected by the Republic Electoral Commission, out of which one has been adopted so far. CRTA also filed three criminal charges against NN persons before the Novi Sad Prosecutor’s Office due to suspicion of a criminal offence bribery at elections (the so-called “vote buying”) in Temerin, Novi Sad and Beocin. Taking into account that the Election Day is only one segment of the election process, the Election Day observation only is not sufficient for the assessment of the overall quality of the elections conduct. According to the results of the CRTA election observation mission „Citizens on Watch“ pre-election campaign monitoring, the election campaign was very short and intense, characterized by unequal media coverage, allegations of pressure on voters, different forms of misuse of public resources in the campaign and highly resticted involvement of independent bodies in the elections oversight and control, primarily of the Regulatory Body for Electronic Media and the Anti-Corruption Agency. The CRTA election observation mission „Citizens on Watch“ will monitor the day of revote in the elections at eight polling stations, scheduled for Tuesday, April 11, 2017. Deployed to all eight polling stations, observers will focus monitoring on the quality of electoral processes during opening of polling stations, voting process, closing of polling stations and vote count. CRTA will inform the public about the voting process during the day of revote through press releases and social networks. Following the official announcement of election results by the Republic Electoral Commission, the CRTA election observation mission “Citizens on Watch” will publish the final report on the elections conduct, with recommendations for improvements. Belgrade, April 2, 2017 – A total of 10 percent of citizens listed in the voters list have voted at the Serbian presidential elections until 10 am, the CRTA election observation mission ‘Citizens on Watch’ stated. Margin of error was +/- 0,5 percent. In comparison to the last year’s parliamentary elections, this is the turnout of 0.6 percent more voters until 10 am. Observers deployed to a random and representative sample of 450 polling stations reported no major problems during voting process. Irregularities during voting process were recorded at several polling stations, including voting without identification documents and not using the invisible spray. Distribution of campaign material less than 50 meters from the polling station was recorded at two percent of polling stations. Recorded irregularities included isolated incidents that cannot be considered a trend. The CRTA election observation mission ‘Citizens on Watch’ mobile team witnessed the situation in front of the polling station in Temerin that could potentially point to the case of vote bribery. The CRTA mission ‘Citizens on Watch’ will file criminal charges against NN persons before the Novi Sad Prosecutor’s Office that should investigate this case and inform the public about the outcome. The CRTA election observation mission ‘Citizens on Watch’ does not have observers in the territory of Kosovo and Metohija, abroad, or within the Bureau of Prisons. The CRTA election observation mission ‘Citizens on Watch’ based its monitoring of the Serbian presidential elections on April 2, 2017 on statistical principles as an effective method for systematic observation of the process during the Election Day, using the Parallel Vote Tabulation (PVT) methodology. This methodology enables the assessment of the entire voting process on the Election Day – opening of the polling stations, voting and vote count – in an unbiased and systematic manner. PVT methodology uses randomly selected sample of the polling stations (PS), which means that the results are representative for the entire country. Observers are deployed to 450 polls and they monitor the entire election process – from the opening of polling stations until the records on the election results are compiled. Based on representative sample, PVT enables detection of irregularities and violations of election procedures on the Election Day and provides information about regularity of the election process for the entire country. CRTA’s election observation is based on the highest international standards, stipulated in the Declaration of Global Principles for Nonpartisan Election Observation and Monitoring by Citizen Organizations. The next public statement of the CRTA election observation mission ‘Citizens on Watch’ is scheduled for 3 pm. A total of 25.1 percent of citizens listed in the voters list have voted at the Serbian presidential elections until 1 pm, the CRTA election observation mission ‘Citizens on Watch’ stated. Margin of error was +/- 0.7 percent. 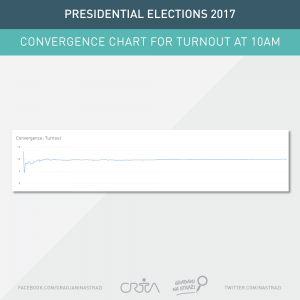 This turnout equals the percentage of voters who voted until 1 pm in the last year’s parliamentary elections. Observers deployed to the random and representative sample of 450 polling stations report that voting process is conducted mainly in accordance with established procedures. The percentage of recorded irregularities remains at two percent. They mainly include not checking voters’ identification prior to voting and handling parallel voters lists. Recorded irregularities still include isolated incidents that cannot be considered a trend that would influence the regularity of voting. The percentage of cases of distribution of campaign material less than 50 meters from the polling station was reduced from two to less than one percent, due to the intervention of polling board members. In response to the information received from the CRTA election observation mission ‘Citizens on Watch’ mobile teams by 3 pm, CRTA will file three criminal charges against acts of vote bribery in the territory of Vojvodina (Temerin, Slana bara and Beocin). The CRTA mission ‘Citizens on Watch’ also received information on potential election irregularities from citizens. In this regard, the mission’s mobile team visited polling stations 73 and 75 at Zemun polje and confirmed cases of parallel voters lists recorded outside of polling stations, as well as unauthorized persons giving voters special pens with green ink to use during the voting process. The next public statement of the CRTA election observation mission ‘Citizens on Watch’ is scheduled for 6 pm. A total of 37 percent of citizens listed in the voters list have voted at the Serbian presidential elections until 4 pm, the CRTA election observation mission ‘Citizens on Watch’ stated. Margin of error was +/- 0.8 percent. In comparison to the last year’s parliamentary elections, this is the turnout of 2.6 percent less voters until 4 pm. Observers deployed to the random and representative sample of 450 polling stations report that voting process is conducted mainly in accordance with established procedures. The percentage of recorded irregularities remains at two percent. They mainly include not checking voters’ identification prior to voting and handling parallel voters lists. The percentage of cases of distribution of campaign material less than 50 meters from the polling station was reduced to one percent. Recorded irregularities still include isolated incidents that cannot be considered a trend that would influence the regularity of the voting process. The CRTA election observation mission ‘Citizens on Watch’ recorded several individual cases where voters were not allowed to vote since someone else had already voted on their behalf, as evidenced through the voters list. The two such cases were recorded in Leskovac and one in Novi Sad, where voters were ultimately allowed to cast a vote by placing the signature at a different place in the voters list. The CRTA mission ‘Citizens on Watch’ also received information on potential election irregularities from citizens, mainly referring to cases of handling the parallel voters lists. Citizens also reported several cases of rather high number of voters who requested to vote outside of polling stations in Kovin, Dolovo, Starcevo, Alibunar and Savski venac in Belgrade. The next public statement of the CRTA election observation mission ‘Citizens on Watch’ is scheduled for 8:15 pm. A total of 49.9 percent of citizens listed in the voters list voted at the Serbian presidential elections until 7 pm, the CRTA election observation mission ‘Citizens on Watch’ stated. Margin of error was +/- 1 percent. In comparison to the last year’s parliamentary elections, this is the turnout of 3.2 percent less voters until 7 pm. Observers deployed to the random and representative sample of 450 polling stations reported that voting process by 7 pm was conducted mainly in accordance with established procedures. In comparison to the observation results at 4 pm, the slight increase in the percentage of irregularities at polling stations, from one to three percent, was recorded. This percentage still refers to isolated incidents that cannot be considered a trend that would influence the regularity of the voting process. Recorded irregularities included voting without identification documents, not checking voters’ identification prior to voting and handling of parallel voters lists. Distribution of campaign material less than 50 meters from the polling station was not recorded in this period. One incident of physical violence was recorded at the polling station 16 in Leskovac, where a political party activist assaulted the president of the polling board and caused him minor injuries, so the police and the ambulance intervened. The police also intervened at the polling station 67 in Pancevo, due to the gathering of extremist groups in front of the polling station. In Zajecar, Alibunar and Knjazevac police stations were opened outside of working ours with the purpose to issue the confirmation that voters without a valid ID card had submitted the request for the issuance of the new ID card. The CRTA election observation ‘Citizens on Watch’ mobile team confirmed that the replacement of ID cards was organized for 50 in Alibunar. The CRTA election observation mission ‘Citizens on Watch’ does not have observes in the territory of Kosovo and Metohija, abroad, or within the Bureau of Prisons. The next public statement of the CRTA election observation mission ‘Citizens on Watch’ is scheduled for after the presidential elections vote count and processing of data collected within the sample (around 10 pm). 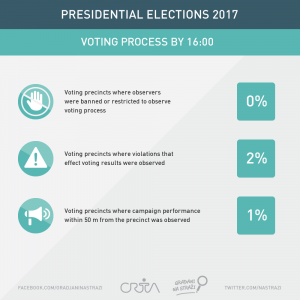 According to 95 percent of processed sample, presidential candidate Aleksandar Vucic won majority of votes, 54.9 percent in total, the CRTA election observation mission ‘Citizens on Watch’ stated. With 16.2 percent of votes Sasa Jankovic came in second place, followed by Luka Maksimovic with 9.4 percents of votes and Vuk Jeremic with 5.8 percent of votes. The overall voters’ turnout was 54.2 percent, with the margin of error of +/- one percent. There were 1.7 percent of invalid ballots. While irregularities recorded at three percent of polling stations included isolated incidents that could not influence the regularity of the voting process, it is of the utmost importance for the authorized institutions to react to electoral breaches and protect the rule of law in these cases. During the Election Day, the CRTA election observation mission ‘Citizens on Watch’ filed three criminal charges related to cases of corruption in the election process. Preliminary report on the Election Day observation will be presented by the CRTA observation mission ‘Citizens on Watch’ on Monday, April 3, at 11 am at the CRTA Press Centre (Topolska 22, Belgrade). Opening of the polling stations for the presidential elections in Serbia went mainly in accordance with the valid procedures, CRTA election observation mission ‘Citizens on Watch’ stated. All observers were granted the access to the polling stations. The total of 87 percent of the polling stations were open on time, 11 percent were open before 7am, while two percent of the polling stations were open with delay. Observers, deployed to the random and representative sample of 450 polling stations, reported that the bags with election materials were secured with the security locks at all polling stations. Control ballots were not casted into the ballot boxes at one percent of the polling stations prior to the voting process. 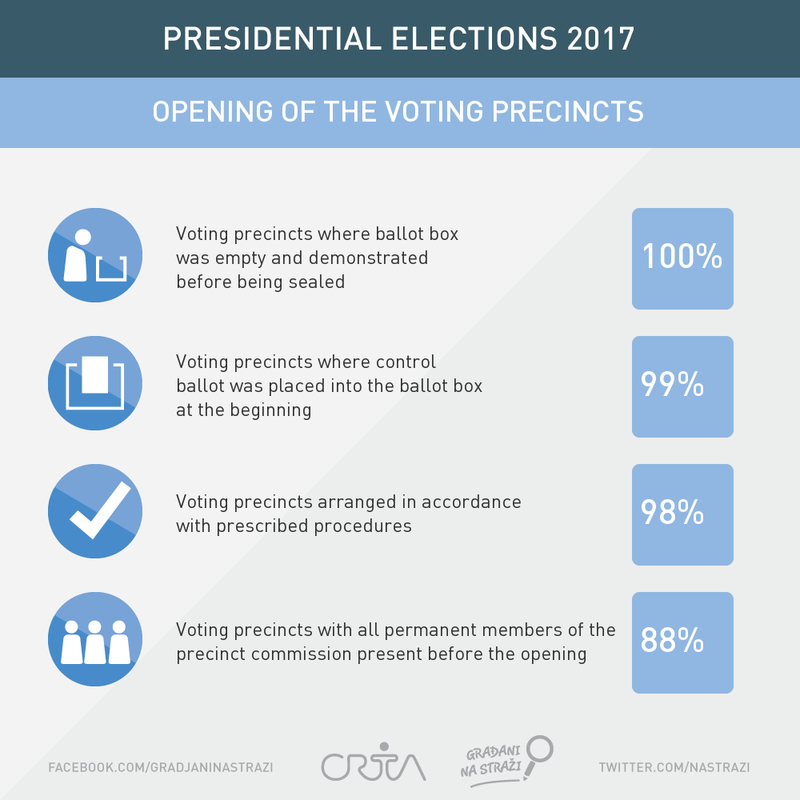 Two percent of the polling stations were not organized in accordance with the valid procedures, mainly in southern Serbia. All the activities were not recorded in the polling board records at five percent of the polling stations throughout Serbia. All the members of the polling boards in permanent composition were not present at the opening of polls at 12 percent of the polling stations, mainly in southern Serbia, as well as at several polling stations in Belgrade and Vojvodina. 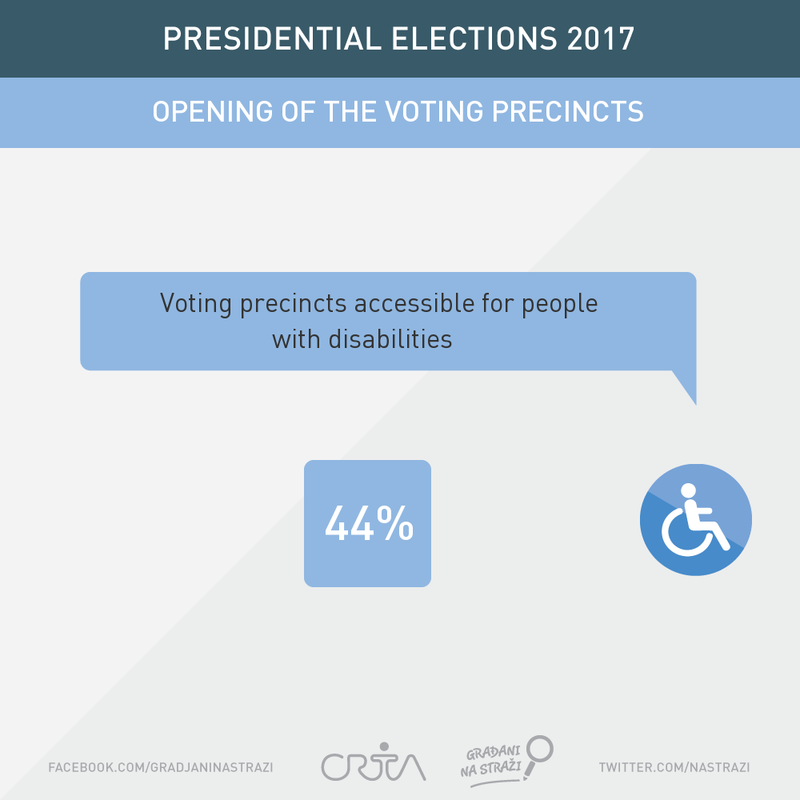 The total of 56 percent of the polling stations were not accessible for persons with disabilities, which is three percent less than in the last year’s parliamentary elections. Some irregularities that were recorded included isolated incidents that cannot be considered a trend. These include the lack of control of voters’ IDs and not using the UV lamp. CRTA election observation mission ‘Citizens on Watch’ does not have the observes on the territory of Kosovo and Metohija, abroad and within the Bureau of Prisons. CRTA election observation mission ‘Citizens on Watch’ based its monitoring of the Serbian presidential elections on April 2, 2017 on statistical principles as an effective method for systematic observation of the process during the Election Day, using the Parallel Vote Tabulation (PVT) methodology. This methodology enables the assessment of the entire voting process on the Election Day – opening of the polling stations, voting and vote count – in an unbiased and systematic manner. PVT methodology uses randomly selected sample of the polling stations (PS), which means that the results are representative for the entire country. Observers are deployed to 450 polls and they monitor the entire election process – from the opening of polling stations until the records on the election results are compiled. Based on representative sample, PVT enables detection of irregularities and violations of election procedures on the Election Day and provides information about regularity of the election process for the entire country. The next public statement of the CRTA election observation mission ‘Citizens on Watch’ is scheduled for noon.